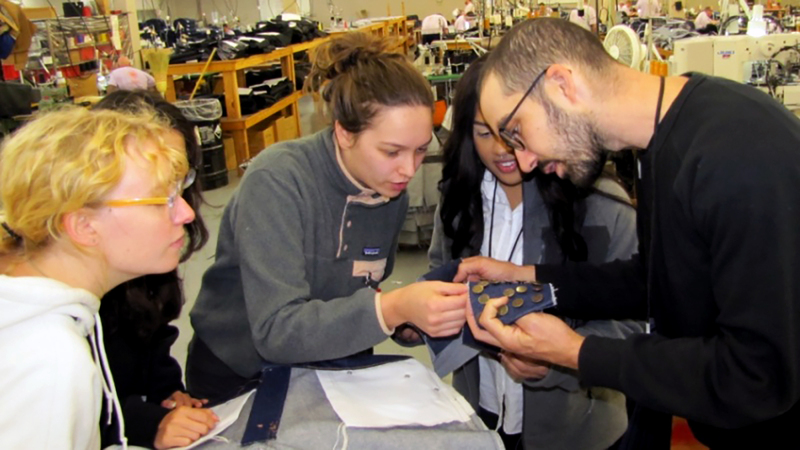 Product Design students recently collaborated with prison inmates based in Pendleton to create a new durable fashion line, Prison Blues, that markets its wares to loggers, farmers, and workers. The apparel is also worn by the prisoners themselves. “Design is not just for rich people; it’s for everyone if you do it right. If you do it thoughtfully, it’s something everyone can benefit from,” said Product Design Department Head and Associate Professor Kiersten Muenchinger. Known as the “Community Clothing Project,” this is the second collaboration between the School of Art + Design’s Department of Product Design and the Oregon Corrections Enterprises. This fall term, the students went to Pendleton’s production facility to meet with the prison inmates who make the garments and learn about the production process. “Being there, students could see the working conditions and chat with the inmates as they did their work. We had a really great discussion around the ethics of prison work,” said Tom Bonamici, an instructor in product design. Read more about the project in Around the O's story, "UO product design program has a case of the Prison Blues."